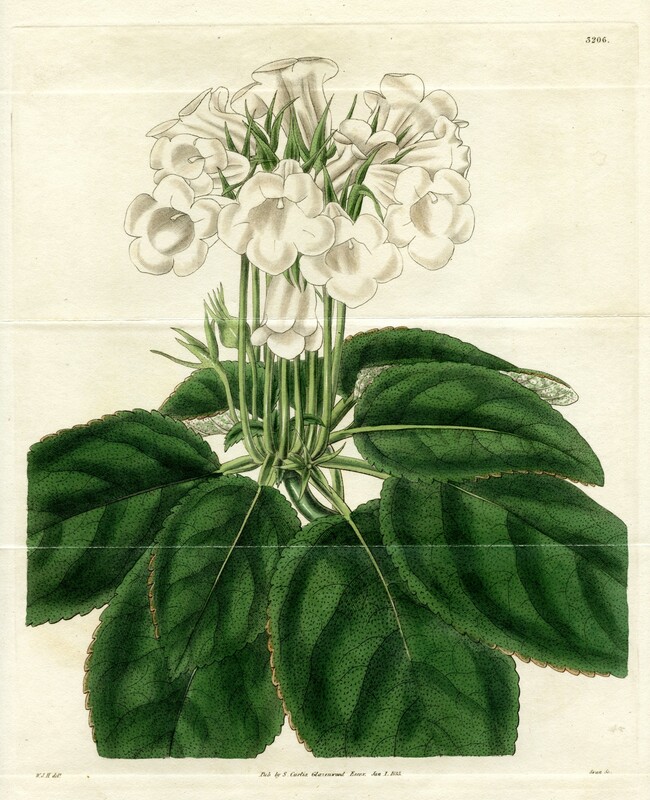 Several illustrations of Gloxinia caulescens were published in the first half of the 19th Century, including this one from Edwards’ Botanical Register, 1928. In the four decades that followed the importation of the first plants of S. speciosa into England in 1815, several major changes occurred in the cultivated plants as a result of hybridization and breeding: (1) they became larger, (2) new flower colors and patterns appeared, and (3) the flower form changed. This progression is well documented by illustrations in the antique literature. Introductions of diverse wild forms collected in Brazil continued for nearly 30 years (although S. regina, a form with dark purple leaves, pushes this to 1903). 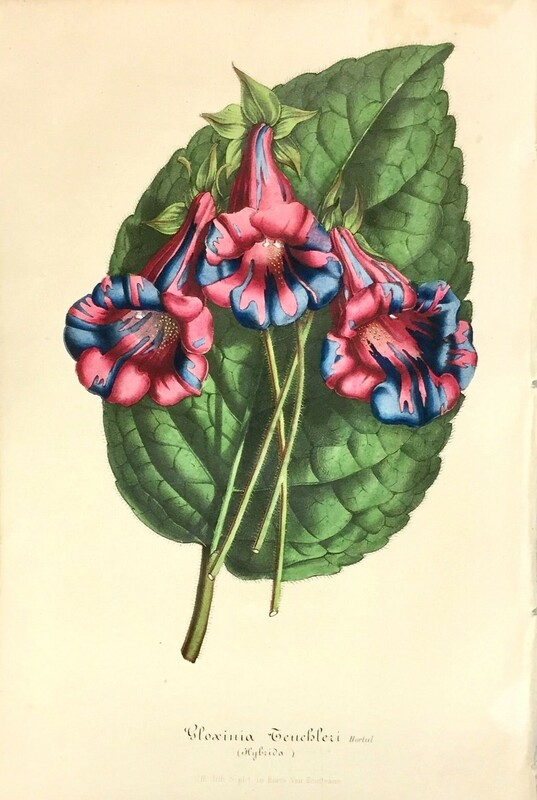 There were no images of new gloxinias published during the ten year period from 1817 until 1828, when G. caulescens was illustrated in The Botanical Register (vol. 13, plate 1127) as ‘Miller’s Pernambuco Gloxinia’. At least four images of G. caulescens were published up until 1849, and it is unclear why it was given a species name distinct from G. speciosa (“caulescent” means to have an obvious stem rising above the ground). One possible reason is that the original collection was said to be from Pernambuco (hence the name), a state in northeastern Brazil that is ~1500 km from the northeastern edge of the species’ documented range in Espirito Santo. Given that this is the only record of S. speciosa from Pernambuco, there is a very good chance that it is incorrect. 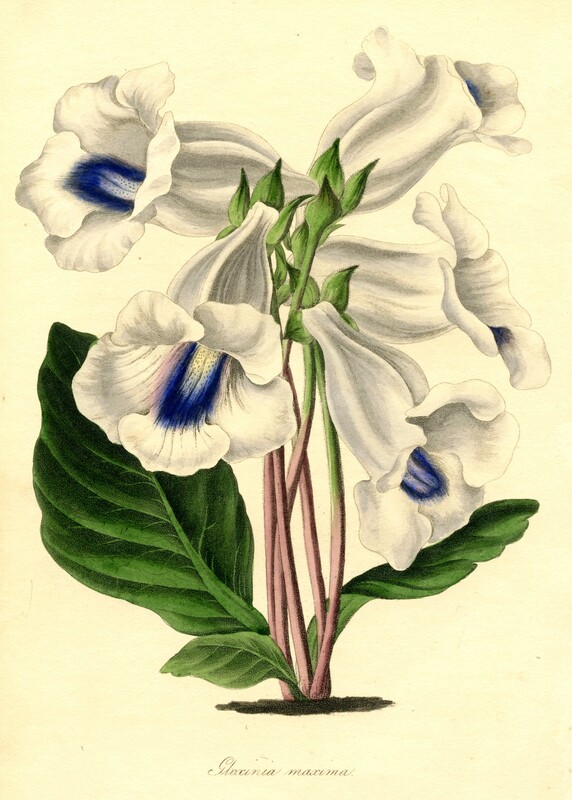 The first image of a gloxinia with white flowers (G. speciosa var. albiflora) appeared in 1833, although there are references to G. candida, another white-flowered collection that was never properly published, as early as 1832 (The Atheneum, March 10, 1832; page 163). Plants with larger leaves, such as G. speciosa var. macrophylla, and also larger and darker flowers, such as G. Passinghamii, were imported into Great Britain during this period. Gloxinia maxima (Paxton 1838) was one of the first intraspecific hybrids within what we now know as Sinningia speciosa. It was a cross of a purple-flowered G. speciosa and the white-flowered G. candida (which was probably the same as G. speciosa var. albiflora, illustrated above). 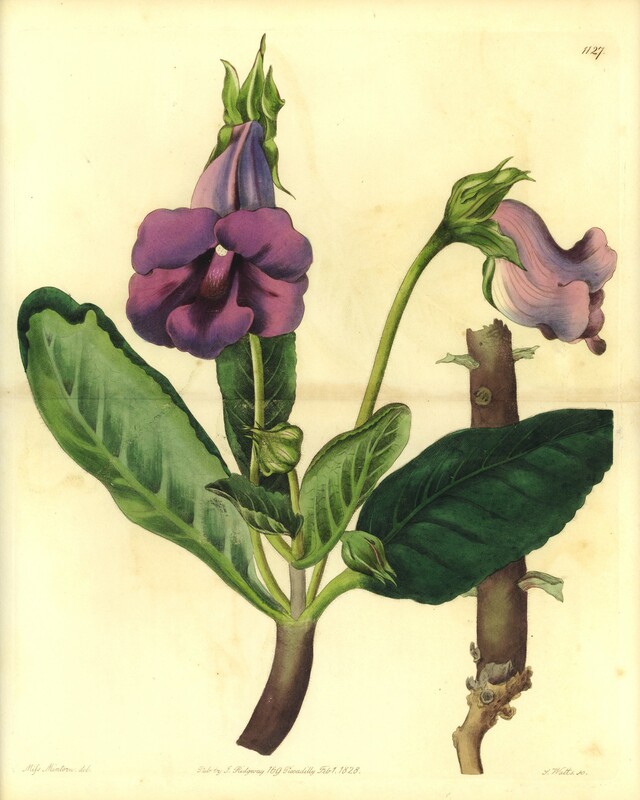 Gloxinia hybrids began to appear in botanical periodicals before 1840, and these early plants were all given illegitimate species names. The first was an interspecific Sinningia hybrid known as ‘Dr. Younge’s Sinningia’ (S. velutina × G. speciosa). This would have originally been considered an intergeneric hybrid because G. speciosa had not yet been transferred to Sinningia. Dr. Younge’s Sinningia seems to have had lasting popularity – there are four images of it known between 1836 and 1857, sometimes referred to as Sinningia youngeana. The first intraspecific hybrid was G. maxima in 1838, which was notable for its large white flowers with blue in the throat. The article accompanying the image states that it came from crossing G. speciosa (purple flowers) with G. candida, but that is all we know about it. A second unusual and popular hybrid went by the name G. ‘Teuchleri’, named for a Mr. Teuchler (or Teichler). G. ‘Teuchleri’ was an intraspecific hybrid involving the red-flowered G. rubra (see below) and G. speciosa, and it had very unusual and unique flowers. The pattern of purple striping against a red background is faithfully reproduced in all five of the images published between 1846 and 1849. Gloxinia teuchleri (Van Houtte, 1847) was a cross between blue/purple and red forms of of what we now know as Sinningia speciosa. The random nature of the purple streaks and splashes is very similar to corolla patterning seen in some petunia cultivars, which are due to a transposable element (a so-called ‘jumping gene’), inserted into one of the genes for pigment biosynthesis that occasionally excises in some cells early in flower development (it is unstable), leaving a purple sector on the red background. Another hybrid was G. rosea alba from 1844, in which G. rubra was used as the male parent in a cross with the aforementioned white-flowered G. candida. A painting by Augusta Innes Withers from around 1865 (‘Gloxinia in a Pot’) shows a plant with nodding white flowers that have a large bright red area in the throat.